BIG NEWS! My PledgeMusic Campaign is LIVE!!! Over the past ten years, I’ve been extremely fortunate to have had three great indie labels release my seven solo full-length CDs & two EP’s. Over these ten years, the music industry has changed though & it’s become increasingly difficult for small labels to continue releasing records. Now I find myself for the first time with the daunting task of having to self-release my latest project, Skeleton Closet. You may be asking yourself, what exactly does that mean? In essence, I’m now the record label. That means I’m responsible for manufacturing the physical copies of the CD/vinyl LP as well as paying to have it distributed & promoted. This involves hiring a publicist for print media as well as a radio promoter. I’ve got great people lined up to tackle the job but it costs thousands of dollars to launch standard three month publicity campaigns. For those of you who pledged already on the previous drive I had last year, that simply covered the recording costs of Skeleton Closet. Now it’s time to give it a proper release. I’ve come up with lots of great Pledge exclusives for you: house concerts, unreleased demos, a box of my favorite things & even a VIP year round pass to all of my 2015 shows. Please look them over & take advantage of PledgeMusic’s ability to let you snag multiple items. 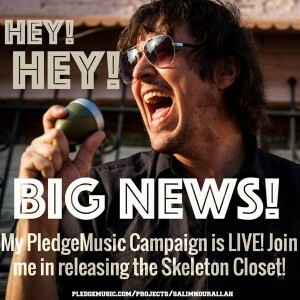 With your help, I hope to give Skeleton Closet a proper send-off in March of next year. If we end up raising MORE than our goal, 15% of the overages will go to an amazing organization named International Justice Mission that combats human trafficking. They protect the poor from violence throughout the developing world. So, let’s get Skeleton Closet out there and do some good on top of it. Thank you all for your continued support – without you I couldn’t do this! You are all greatly appreciated by me. 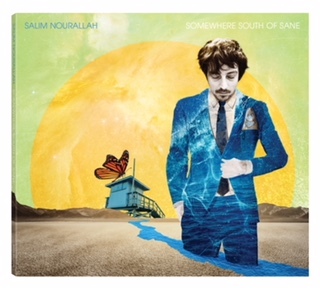 2014 Salim Nourallah. All rights reserved.